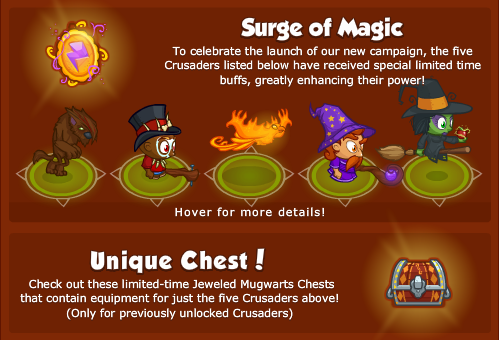 Tags: new, campaign, mugwarts, mischief, promo, surge, magic. We heard you like campaigns. 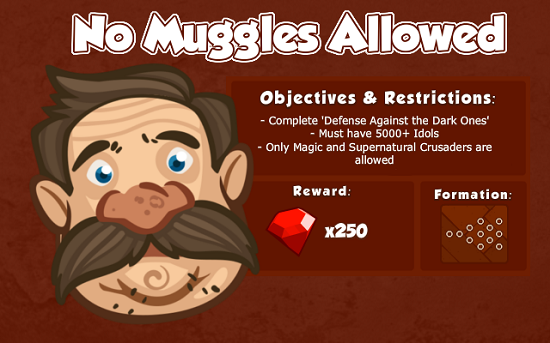 Today we're launching the Mischief at Mugwarts campaign, a permanent update to Crusaders for you to play and enjoy! 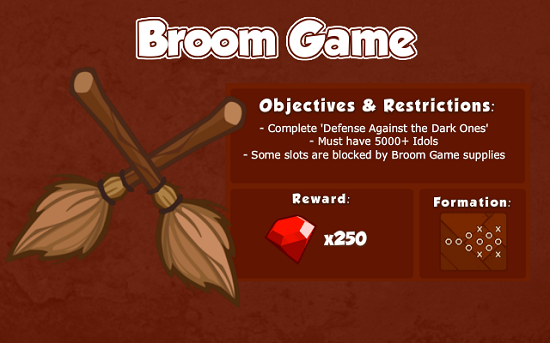 It features six new epic objectives and a dustpan formation designed to challenge even the most veteran player. 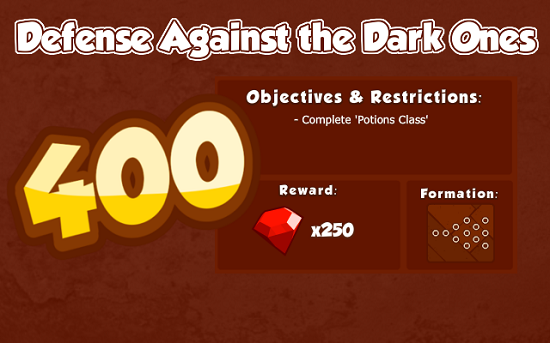 However, the reward is a total of 1,500 precious Red Rubies if you can complete them all! The new campaign takes the Crusaders back to school. A magical school, no less, where students are instructed in the ways of sorcery and participate in sports involving flying cleaning tools. It could just be us, but it does sound eerily familiar. 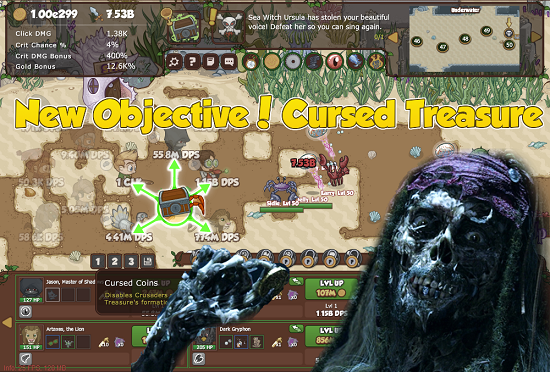 To support the new campaign Emo Werewolf, Khouri, the Witch Doctor, Fire Phoenix, Merci, the Wizard and Wendy the Witch if you have her, get a limited time buff to greatly enhance their power, applied automatically! Can their weekend power help you through a tough objective? As well as the automatic buff, you can purchase a unique Chest! Inside this special chest you'll find 2 pieces of gear, 1 of which is guaranteed to be Rare or better, for only those 5 Crusaders! Will you get a piece you're missing? Plus, you get 2 Trinkets and a Time Warp. As well, your first purchase of chests will award you the awesome Black Phoenix Death Mask Golden Epic, which boosts Khouri's Koffee Potion ability by 150%! The special buff and sale will run until Monday February 29th at Noon PST! 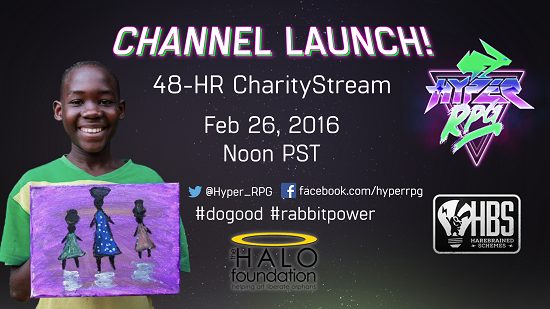 Tags: hyper, rpg, charity, halo, foundation, jeweled, chests, giveaway, donate. This weekend we're proud to support the launch of the new Twitch channel for Hyper RPG, which will feature a 48-hour charity drive for the HALO Foundation. We are donating some Jeweled Chest bundle codes for Crusaders of the Lost Idols and for the duration of their inaugural Twitch broadcast you'll have a chance to win if you donate! Hyper Rabbit Power Go! is a new Twitch Channel hosted by Zac Eubank, former Showrunner of the famous Geek and Sundry Twitch channel. Hyper RPG! will highlight the critical mass of both tabletop and digital game design and development talent in the Northwest, and the vibrant and diverse gaming geek culture that abounds in the area. The HALO Foundation empowers youth in the greatest need to become contributing members of their communities. HALO is a volunteer-driven, grassroots non-profit with 87 percent of donations going directly to programs. Currently, HALO supports 21 orphanages and programs in Uganda, Kenya, Mexico, India, Guatemala, Nicaragua and the United States. Read more here. The 48-hour event starts at 12 pm on Friday, February 26th and will feature exclusive previews of new video games, tabletop games, and live music. Every two hours as part of the festivities Zac and his team will be giving away $20 Jeweled Chest bundles (15 Chests). If you have donated to the HALO Foundation during course of the stream you'll have a chance to win one. Details on how to participate are included in the broadcast. 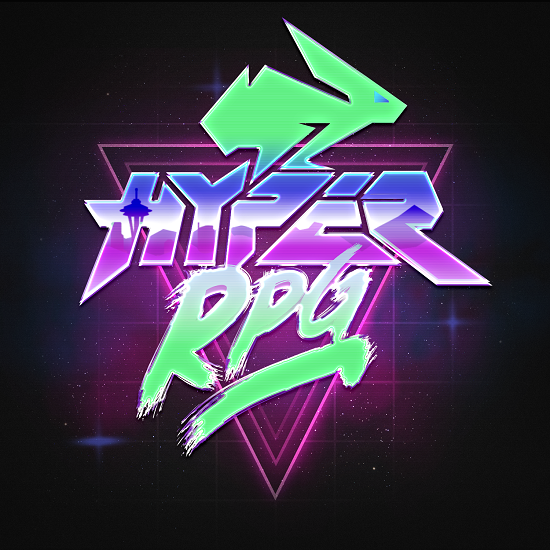 Check out the official website and Twitch channel and help make the launch of Hyper RPG a success by tuning in today. Tags: bot, crusaders, jeff, sumner, python. We were reading all your tweets that we came across a rather curious profile called @CrusaderBot on Twitter. It immediately piqued our interest. Crusader Bot plays Crusaders of the Lost Idols all by itself without the need for (much) human input and then tweet about its progress. 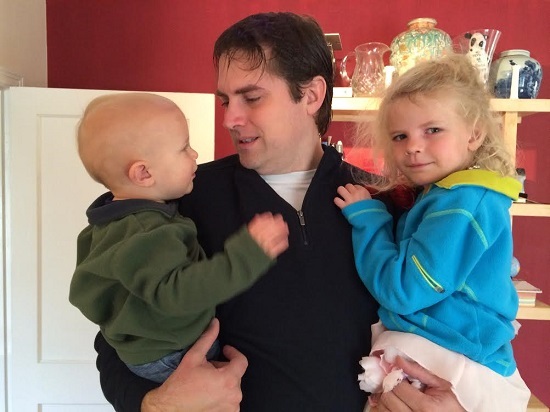 The Crusader Bot creator, Jeff Sumner, is an avid board gamer, programmer and agile coach from Austin, Texas, who likes to play Lost Idols after his kids are tucked in bed. We asked him about his project. Crusader Bot is a Python program I wrote, which plays Crusaders for me from start to reset. It takes over the mouse and keyboard and plays it as if a person was playing. Every time it resets, it sends out a tweet to @CrusaderBot. How did you come up with the idea for @CrusaderBot? 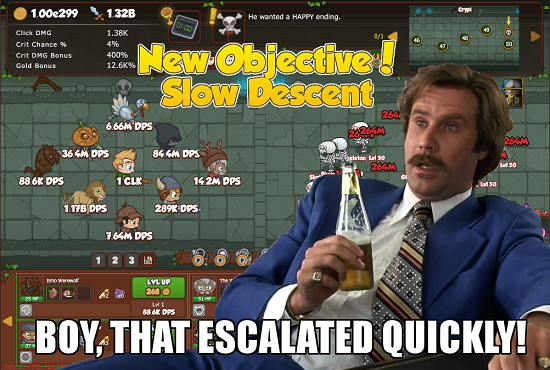 I wanted to complete my daily clicker quests and was contemplating downloading an auto clicker. Instead, I decided to write my own. I had attended a talk by Al Sweigart, and he had created a program which played Sushi Go for him. I highly recommend his books, as well as his Udemy course which is just a lecture series covering the same material that it is his book. The book and course are designed to teach even non-programmers how to code. After clearing out my clicker quests, I made the bot activate its powers and level up Werewolf and Hermit every few minutes. Next the program would move the mouse around to gather resources and move to the next area as quickly as possible. 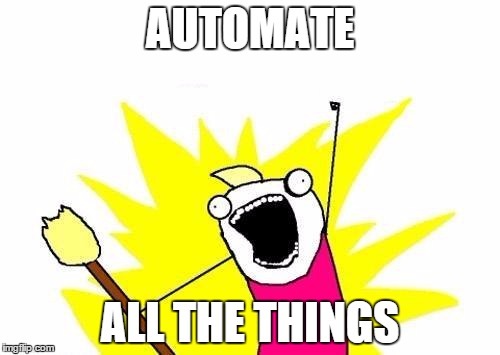 Today, the bot gathers resources, activates powers, buys skills, and resets once the bots stop advancing. Each time it resets, it sends out a tweet to @CrusaderBot. What is your goal or what do you hope to achieve with @CrusaderBot? I enjoy learning new technologies, I wanted to figure out how to use Python to control the mouse and keyboard. I took my bot to lots of silly places, just to figure out the technologies. It uploads screenshots to Imgur, and to Twitter. It accepts input from an IRC channel, Twitter, and the keyboard. I got it broadcasting on Twitch.tv briefly. I even tried getting image recognition to work. And of course, I also wanted to get MORE idols! There are a number of improvements I could make next. 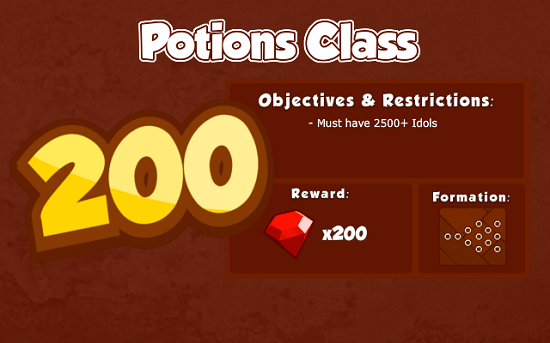 Interactivity with other users, and general gameplay improvements but it currently earns about 28 idols per hour, and I think I could improve that to about 34 idols per hour, only it would take a fair bit of effort so I'll probably just leave it as is. What decisions does @CrusaderBot make that a human player wouldn't do? Every minute - level up Hermit and Werewolf. Every 5 minutes - Power up all the skills. 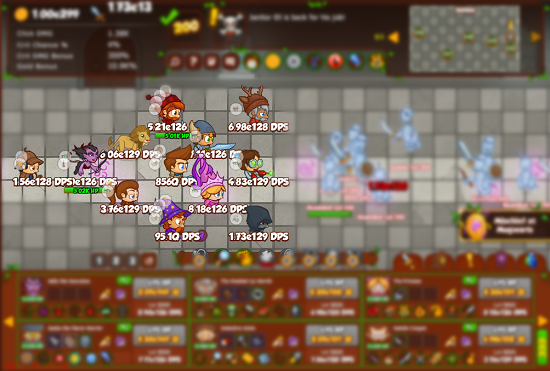 Every 10 minutes - Level all, then Buy skills, stop once they have all been purchased. Check to see if we have stopped auto-advancing. If so, use your buffs and keep going a little further. 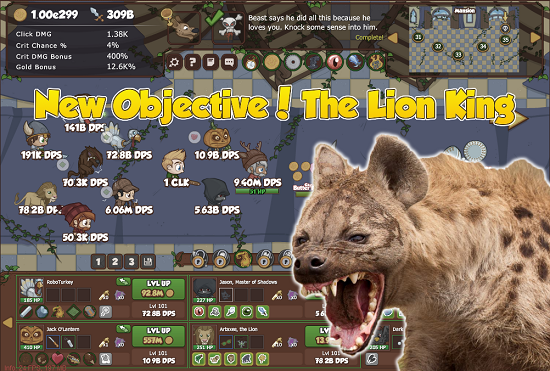 Stop leveling Werewolf and Hermit and start doing level all. If you get stopped again, reset. The one thing it seems to do far more efficiently than human players is not getting stuck. Spending five days trying to complete the hard to get objectives is much less rewarding than my bot doing 20 resets, and earning another 1500 idols, and hundreds of chests, so it hasn't gotten very far in the max levels quest. It got to level 361 in the early days before I learned to reset early and often. What are the biggest challenges creating @CrusaderBot? The biggest challenge was figuring out how to do keyboard I/O with Python. Creating new threads, and getting the right packages installed was a pain. I've had several dead ends that I had to give up on, such as using image recognition to identify where things were, it worked but only with one screen size and resolution. But these shouldn't scare anyone thinking about learning programming to write a bot like this, none of the biggest challenges were things that needed to be done. What are the latest updates for @CrusaderBot? I made an improvement when using buffs. Turning on Power Boost, Siphon Power or Accuracy lets me go an additional couple boss levels. Using a Time-turner at the end then nets me a few extra idols for the run. My bot has now made it as far as level 546, thanks to the awesome power of talents. Check out @CrusaderBot on Twitter and follow along to see how it get's on. Tags: new, content, objectives, crusaders, idols, event, valetine, day, merci, mix, up. It's Valentines Day for Merci, but being a Mad Wizard can be a lonely life. Merci's decided to mend his loneliness in the only way he knows how: by mixing up a fix-all love potion! Unfortunately, while preparing his concoction he swiped left instead of right. The resulting concatenation of amorous ardour and wayward magic opened a portal to Super Love Land and beyond. Just like your real life preparation for Valentine's Day, your mission is to complete five new objectives by using the new Heart formation and slaying legions of monsters. We're pretty sure that's how it works, right? Fittingly for the ultimate celebration of romance, we have two new Crusaders for you to entice and add to your roster. Rocky, the Rockstar, is a swirling ball of testosterone, whose raw sexual power is tempered only by his genuine charm. The Juliet to this Romeo is the second new Crusader, Sally the Succubus, the winsome demon who leaves an army of admirers in her wake. 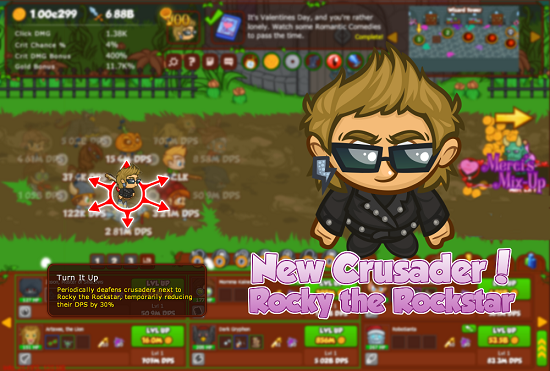 Rocky's talents include boosting his DPS by having female Crusaders around him, starting at 25% and increasing up to a deafening 250% per lady with his normal Epic equipment, and even further to 350% with his Golden Epic. 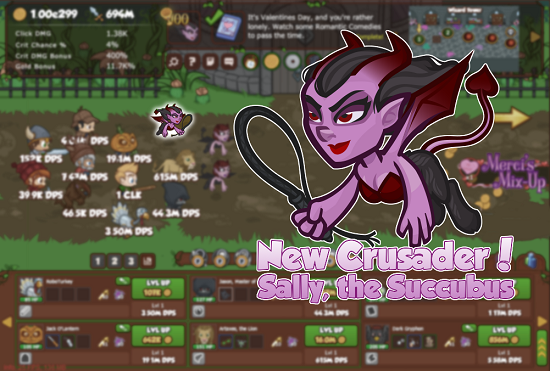 Sally includes the ability increase her own DPS up to a maximum of +300%. However, beware of putting female Crusaders next to her as it'll reduce her DPS by 25% per fellow lady. However, her other skill boosts all female Crusaders' DPS by 20%. Can you find the perfect spot for her in your formation? 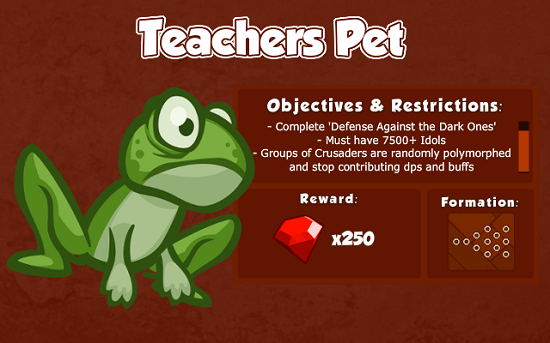 We also have three additional objectives. Broken Hearted requires 500 idols to play and sees the love-lorn Crusaders heart formation split in two with the three middle slots taken up by a crack. 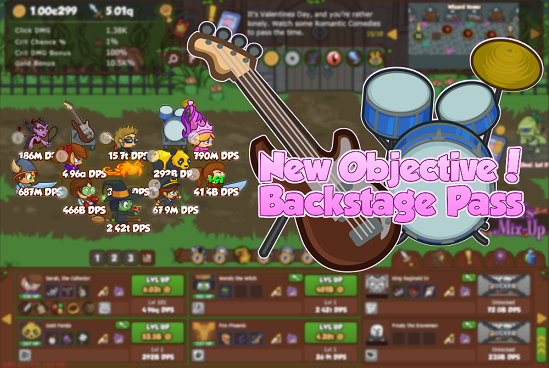 Backstage Pass requires 1,000 idols and only allows you to choose Rocky and female Crusaders. Furthermore, two slots are taken up with Rocky's band equipment. The final event objective, Dangerous Allure only allows your to choose Sally the Succubus and male Crusaders and requires 1,500 idols to play. In a unique twist, the slots in the formation will steadily be taken over by zombies the further you progress! Continuing our tradition of recognizing some of our more famous fans, this event we're honoring regular streamer, Tedessence. 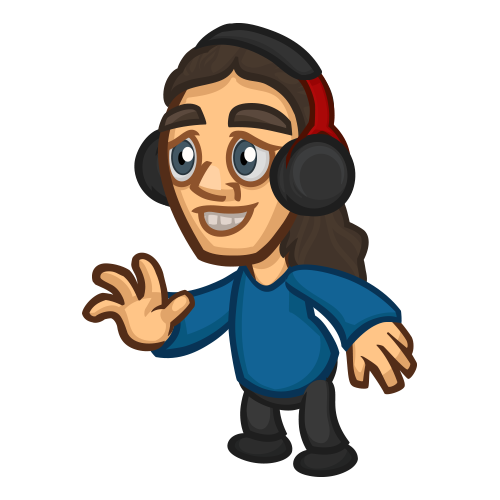 Ted has been with us almost since launch and has been producing a constant stream of Let's Play videos on Twitch which you can check out here. You'll be able to find his avatar as a boss monster in the Valentine's Day event. Pass on our love for him by smiting him down in Crusaders' fashion. Merci's Mix-Up event will run until February 23rd to give you plenty of time to woo those objectives into submission. Tags: new content, bw2, event. The residents of the Commons are putting on a Valentine’s Day dance, so you know what that means! Helping with the set-up through one-time and daily quests, plus turn-ins! It’s not Valentine’s without presents! Help stock the stands with Chocolates, Teddy Bears and Roses by turning in Candy Hearts as the stations unlock. The event organizer seems a bit frazzled. Why don’t you help her out by doing her set-up quests each day? And don’t forget to keep those party supplies topped off! Nate is looking for a date. Help him choose a girl that can put up with his antics, and help the one he doesn't pick get over her grief with some Ice Cream daily quests until it's time to help Nate’s rejected girl through the 5 stages of grief. All five quests will unlock right after each other and then she will have a new daily quest for you. Once the Valentine's dance has started, you get to look for the partner of your choice to share a moment on the dance floor. There are 6 brand new setup quests available for everyone to enjoy, so keep your eyes peeled! Jim and Sasha's relationship quests have also been updated. If you haven't married them yet, you'll see either their Dating or Proposal quest line. If they are married, you get to help the pair pack for their honeymoon. There are a total of ELEVEN possible achievements to earn in the Valentine’s Day 2016 event. Party Planning Committee - You helped at least once at each Valentines Station. Party Planning Leader - You helped 50 times at each Valentines station. Pet Detective - You found each of the lost pets at least once. Nate's Date - You helped Nate pick a Date. The Five Stages of Grief - You helped Nate's rejection get through her pain. Two Left Feet - You danced at the Valentines Dance. We also have 3 achievements from previous years which may be earnable by spending Bush Bucks if you missed getting them the first time around. Customization Lover - You bought all the Valentines things from 2013! Customize Your Love - You bought all the Valentines things from 2014! Heart-wearer - You bought all the Valentines things from 2015! *The Valentine’s mini-golf piece is not included in the Hearts Hearts Hearts! achievement. New 2016 Pet Packs -- COMING SOON! Tiny Penguin - Turns up to 25% of your Nothing wins into Mana! This event runs until Friday February 19th 2016 @ Noon PST (8pm GMT). Post your love for the event here! 2016 hasn't started out the greatest in the world of iconic heroes, with so many passing away in January. We celebrated the lives of two celebrities that made an impact on our childhoods with a short quest in one of our favourite games. As well, we put out a call to action to our Bush Whacker 2 players to help us make a donation to the fight against cancer. All the proceeds received by us at Codename from those who bought the Pink Cancer Ribbon ranch item were donated. With your help, we raised over $1,000 USD to donate to the Canadian Cancer Society! Thank you to everyone who contributed! The Canadian Cancer Society is a national, community-based organization of volunteers whose mission is the eradication of cancer and the enhancement of the quality of life of people living with cancer. They work with other partners nationally to achieve their goals. About half of cancers can be prevented, and screening for certain cancers can result in early detection, when the disease is most treatable. For more information about the Canadian Cancer Society, you can visit their website. February 4th is World Cancer Day. Find out how you can get involved in your location by visiting the World Cancer Day website.